Our first (3/29) and now our second (5/31) shows have sold out! Please go to our CONTACT page to get on our newsletter list for when we know our dates for future shows. James Braly, whose critically acclaimed Off-Broadway hit, “Life In A Marital Institution” recently finished a 14-City National Tour presented by Meredith Vieira Productions, is developing a new show in Hudson, NY. 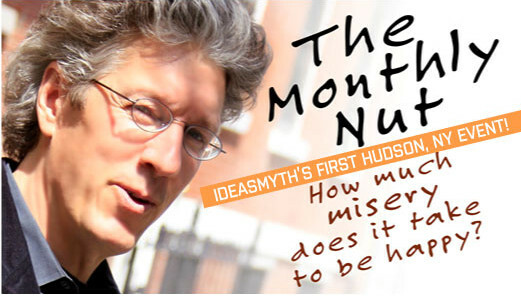 Ideasmyth welcomes you to join him for a workshop performance of “The Monthly Nut (How Much Misery Does It Take to Be Happy? ),” an autobiographical story that asks: Can you love your lifestyle–without hating your life? As James seeks answers, he encounters a boss who worships Hitler, a closeted secret admirer/kidnapper, a movie star, and a ghost. This is a work in progress–comments welcome après theater over Cafe Le Perche’s awesome bistro fare. This event will take place at Cafe Le Perche, in the wonderful town of Hudson, New York. If you are coming from out-of-town, we recommend staying at The Hudson Milliner or 26 Warren B&B. James Braly is the writer and performer of the monologue Life in a Marital Institution, which premiered at the Edinburgh Festival Fringe, sold-out 59E59 Theaters in New York City, and transferred Off Broadway to the Soho Playhouse. Reviewed as “gaspingly funny” (Variety), “never less than excellent” (The New York Times), and “a masterpiece of storytelling” (The List), the show has played over 120 performances and is currently on tour around the country. Optioned for film & television by Meredith Vieira Productions, James is currently writing the screenplay adaptation. Life in a Marital Institution is also a forthcoming memoir from St. Martin’s Press. 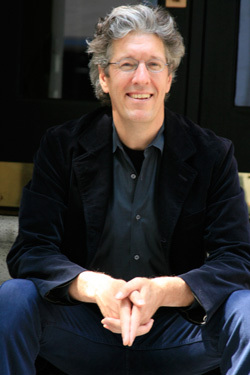 His stories have been broadcast nationally on This American Life, NPR and Marketplace, and his essays appear in the recently published anthologies, Afterbirth (St. Martin’s Press) and Mr. Beller’s Neighborhood (W.W. Norton). James has performed autobiographical stories at The Whitney Museum, Symphony Space, and The Moth, where he was featured on the TNT National Story Tour and is the first two-time winner of the Moth GrandSlam storytelling competition. Interested in Life in a Marital Institution? Purchase and listen to the show via iTunes or Amazon. Inspired by the Le Perche region of France, the Cafe Le Perche menu is a modern take on classic bistro fare, built on their handcrafted artisanal breads. Their location features a baked goods market, intimate bar, elegant dining room, lounge, and outdoor terrace. Dine in, take out, or let them host your next event. Ideasmyth is a holistic creative communications, coaching and branding consultancy founded by Victoria C. Rowan whose previous professional lives included founding the multi-million-dollar education division of Mediabistro.com, artistic programming of the greatest living writers for the 92nd Street Y, writing for dozens of publications, websites and public radio including: Time Out NY, New York Magazine, The New York Times Magazine, The Financial Times, The Moscow Times and NPR. Through personalized coaching and workshops, Ideasmyth mentors and supports clients in creating and cultivating their endeavors, increasing their brand exposure and achieving their most important personal and professional life goals. Since 2000, her Independent Project workshops and coaching practice have helped nearly 1,000 writers produce many critically acclaimed books, theater, websites and other multimedia projects. Posted in Communications, Loving Your Work.